The war in Ukraine is impeding attempts to improve the business climate in Russia, according to the head of the Moscow State University Department of Economics, Alexander Auzan. The Russian authorities therefore have to invest in infrastructure projects in order to overcome the crisis, say analysts. 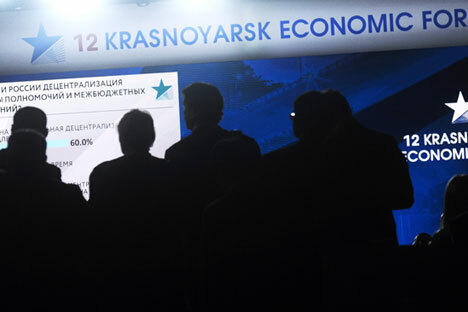 The task of improving the business climate in Russia is being hampered by the war in Ukraine’s Donbass region, the head of the Moscow State University Department of Economics, Alexander Auzan, said at the Krasnoyarsk Economic Forum, held in the central Siberian city from Feb. 27 to March 1. According to Auzan, the main causes of the crisis in Russia are not the Western sanctions or the devaluation of the ruble but the fact that the concept on growth based on the export of raw materials and growing consumer demand has exhausted itself. “In 2011, investment began to drop; the investment engine began to slow down,” he said. In a situation like this, according to Auzan, the state must either improve the business climate in the country or, on the contrary, introduce tough market regulations, restrict foreign currency circulation and then invest funds in infrastructure projects. “In order to realize the first option, it is necessary to end the war in the Donbass. I don’t understand how it is possible to attract investment in an information war,” said Auzan. Having said that, he continued, instead of choosing the second option, the Russian government is likely to opt for an inertia scenario, which does not envisage any drastic reforms in the hope of a future rise in oil prices. As head of the Skolkovo School of Management, Andrei Sharonov, pointed out, the Russian economy is under the influence of two opposite examples: western (Anglo-Saxon practices) and eastern (based on the experience of China and South Korea). “The application of the western model, which implies more individual activity, is limited in Russia because our people lack the necessary civil activity and responsibility. As for the eastern model, we are not ready for it because our state apparatus is not solid enough,” he said. In Sharonov’s opinion, the main reason behind this state of affairs is that there is no consensus in society. According to the vice-chancellor or of the Russian Presidential Academy of National Economy and Public Administration, Vladimir Mau, Russia is now going through several crises, including a partial overlap with a global crisis, similar to the 1930s, and a standard market economy cycle, and is under the impact of the double shock of the Western sanctions and falling oil prices. “In my understanding, the experience of the mid-1980s is relevant since from the macroeconomic point of view, the situation is similar. The Soviet government chose the path of promoting growth through artificial means, which brought about catastrophic results,” he said. In the opinion of Vladimir Mau, Russia’s economic recovery is primarily linked to increasing the export of goods other than raw materials. “In our circumstances, export of goods other than raw materials is the real import substitution that the government is talking about. Otherwise, we shall end up with many domestically produced unwanted goods, as was the case in the USSR,” he said. In that case, Mau continued, the Russian government should not impose restrictions on exports, even in the event of sharp price rises on the domestic market. Earlier, in December 2014, Russia introduced duties on grain exports, attributing the decision to the need to curb rising grain prices on the domestic market. The problem is that the devaluation of the ruble against the U.S. dollar and the euro has made exports more attractive, prompting producers to reduce supplies to the domestic market. “The moment we start exporting goods other than raw materials, we start discussing restrictions and the introduction of duties on the export of grain, metal products, fertilizers, etc.,” Mau warned. According to Russian First Deputy Prime Minister Arkady Dvorkovich, economists’ proposals will form part of the anti-crisis plan that the cabinet of ministers is working on. “The first part of the plan is aimed to assist enterprises in overcoming the immediate consequences of the crisis,” he said. The second part of the initiative, meanwhile, envisages serious structural transformations in the economy as a whole. “We need to combat inflation, to streamline budget spending, to invest in infrastructure,” said Dvorkovich.